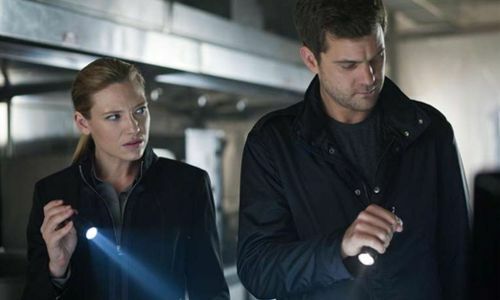 Cultural Wormhole: Fringe - "Marionette"
Olivia (Anna Torv) and Peter (Joshua Jackson) on the trail of an organ thief. Going into this episode I was worried that after wrapping up an incredible eight-part arc, 'Fringe' would fall back into old patterns. Luckily, my fears were unfounded and we got a compelling epilogue to the previous arc. While "Marionette" was a Monster of the Week episode, albeit a creepy and engaging one, it was well-adorned with very strong character moments throughout. The victim at the beginning of the episode wasn't the only person suffering from a stolen heart. Olivia is still coming to terms with the fact that Fauxlivia completely took over her life for two months. Her co-workers were fooled. However, it's the revelations from Peter about the depth of his relationship with her doppelganger that cut the deepest. Anna Torv was particularly great during the scene when Peter tells Olivia everything. The camera stays on her face while Peter tells her about his romantic involvement with Fauxlivia and Torv's expression slowly melts at a glacial pace. It's effective and heart-wrenching. What makes it worse is that she understands, as she puts it at the end of the episode, the facts of the matter. Still, she can't help but be heartbroken. We're also treated to a couple solid non-case exchanges between Olivia and Broyles and later with Olivia and Astrid. In fact, the entire ensemble was well served in the episode and given a number of scenes beyond the typical case work. Through it all, we get to see how Olivia has changed. Her emotions are a lot closer to the surface and I think this will continue to make me care about the character even now that she's back in the proper universe. The actual case involving someone stealing the organs of a dead young woman that were transplanted into other people so he can reanimate her was one of the more interesting cases. I still can't decide if the sequence where the re-animator strings up the dead girl like a marionette and makes her dance was extremely silly or creepy and ingenious. Probably all of the above. One thing that I didn't enjoy was the in-your-face Sprint product placement in the middle of the episode. Look! Astrid and Peter are using real-time video chat! On Sprint phones! See the logo! The episode ended with the return of September the Observer. Other than their usual "Where's Waldo?" placement in each episode, the Observers haven't popped up at all this season. They're certainly going to be involved in the next episode when the show returns at the end of January and I hope that it will be the kick off of another episode to episode arc. These first nine episodes have set the bar pretty darn high and I look forward to seeing if the writers can rise to the occasion.